Many people may have heard stories about their friends having treatment for their spinal pains in hospitals or physiotherapy clinics where they were strapped into a contraption and having their back or neck stretched. This device is called a traction machine. To some the description may sound intimidating or even medieval, but in fact, traction is a very gentle form of treatment and is extremely effective when applied appropriately in specific conditions. What does a traction machine do? As the name implies, a traction machine applies traction to the spinal column. Depending on where the pathology is, traction can be applied to both the lower back and the neck. This is usually done by wrapping a harness around the lower back or under the chin and base of skull. 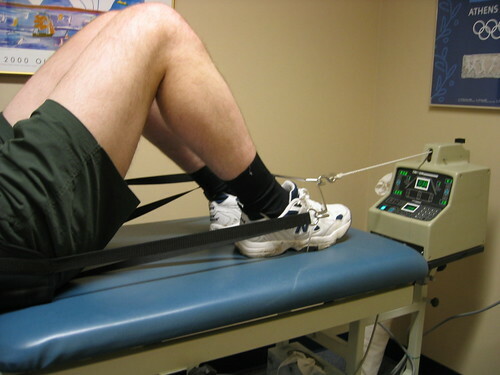 The harness is then attached to the machine that pulls at a controlled speed, rate and weight as set by the physiotherapist. Imagine the neck pulling in one direction by the traction machines and the body weight acting as a counter force. This results in the “lengthening” of the cervical spine. As the spinal structures are gently pulled away from each other, the pressure within the structures such as the disc reduces, and the space from which nerves exit the spinal cord increases. Therefore, traction is suitable for conditions with compressive stress within the spinal structures like disc proplapses and nerve impingements. What conditions are treated with traction? Besides disc prolapses and nerve impingements of the cervical and lumbar spine, another condition that traction is sometimes used for is cervical spondylosis. The idea here is that because the traction machine can pull and release to a pre-set weight, it creates a lengthening-shortening cycle, hence allowing stiff joints to move. Anecdotally, traction therapy has not been found to be as effective as other manual techniques available. Firstly, functionally the spinal joints do not move in that manner and secondly, other issues such as muscle spasm and joint mal-position cannot be addressed this way. However, it can be use as a preliminary technique when the client is in too much pain to be treated manually. When should traction not be used? In general, traction should not be used when there is a disease process that reduces the body’s tolerance to force. Traction is contraindicated or use with caution when there is a tumour, infection, vascular disorder, ligamentous instability, inflammatory arthritis and osteoporosis. Traction is not a long term solution. It must be remembered that traction is a tool that is useful only for conditions where decompression is required, such as nerve impingements and disc prolapses. As poor posture, movement patterns and muscle strength are the primary causes for disc prolapses and impingements, traction alone may reduce the pain but is not a long term solution to the rehabilitation of disc prolapses and nerve impingements. A study recently conducted on the effects of traction and its treatment effects on clients with neck pain and the associated arm pain showed no significant additional benefit when compared to treatment without traction. Correcting posture, movement patterns and building core strength are the long-term solutions to back pain. Young I A, Michener L A, Cleland J A, Aguilera A J and Synder A R. Manual therapy, exercise and traction for patients with cervical radiculopathy: A Randomised clinical trial. Physical Therapy 2009:89;632.